Low waters at Lake Mead, behind the Hoover Dam on the Nevada/Arizona border. A dam is any barrier that holds back water; dams are primarily used to save, manage, and/or prevent the flow of excess water into specific regions. In addition, some dams are used to generate hydropower. This article examines man-made dams but dams can also be created by natural causes like mass wasting events or even animals like the beaver. Another term often used when discussing dams is reservoir. A reservoir is a man-made lake that is primarily used for storing water. They can also be defined as the specific bodies of water formed by the construction of a dam. For example, the Hetch Hetchy Reservoir in California’s Yosemite National Park is the body of water created and held back by the O’Shaughnessy Dam. One of the most common types of major dams is the arch dam. These masonry or concrete dams are ideal for narrow and/or rocky locations because their curved shape easily holds back water via gravity without the need for a lot of construction materials. Arch dams can have one large single arch or they can have multiple small arches separated by concrete buttresses. 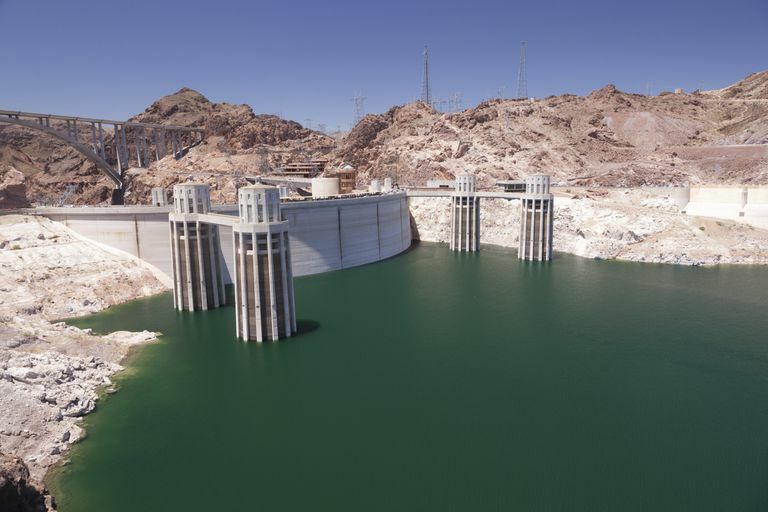 The Hoover Dam which is on the border of the U.S. states of Arizona and Nevada is an arch dam. Another type of dam is the buttress dam. These can have multiple arches, but unlike a traditional arch dam, they can be flat as well. Normally buttress dams are made of concrete and feature a series braces called buttresses along the downstream side of the dam to prevent the natural flow of water. The Daniel-Johnson Dam in Quebec, Canada is a multiple arch buttress dam. In the U.S., the most common type of dam is the embankment dam. These are large dams made out of soil and rock which use their weight to hold back water. To prevent water from moving through them, embankment dams also have a thick waterproof core. The Tarbela Dam in Pakistan is the world’s largest embankment dam. Finally, gravity dams are huge dams that are constructed to hold back water using only their own weight. To do this, they are constructed using extensive amounts of concrete, making them difficult and expensive to build. The Grand Coulee Dam in the U.S. state of Washington is a gravity dam. The first and usually largest type of reservoir is called a valley dammed reservoir. These are reservoirs that are located in narrow valley areas where tremendous amounts of water can be held in by the valley’s sides and a dam. The best location for a dam in these types of reservoirs is where it can be built into the valley wall most effectively to form a water tight seal. To construct a valley dammed reservoir, the river must be diverted, usually through a tunnel, at the start of work. The first step in creating this type of reservoir is the pouring of a strong foundation for the dam, after which construction on the dam itself can begin. These steps can take months to years to complete, depending on the size and complexity of the project. Once finished, the diversion is removed and the river is able to flow freely toward the dam until it gradually fills the reservoir. In addition, the creation of a reservoir requires the flooding of large areas of land, at the expense of the natural environment and sometimes villages, towns and small cities. The construction of China’s Three Gorges Dam, for example, required the relocation of over one million people and flooded many different archaeological and cultural sites. Another major use of dams is power generation as hydroelectric power is one of the world’s major sources of electricity. Hydropower is generated when the potential energy of the water on the dam drives a water turbine which in then turns a generator and creates electricity. To best make use of the water’s power, a common type of hydroelectric dam uses reservoirs with different levels to adjust the amount of energy generated as it is needed. When demand is low for instance, water is held in an upper reservoir and as demand increases, the water is released into a lower reservoir where it spins a turbine. Some other important uses of dams and reservoirs include a stabilization of water flow and irrigation, flood prevention, water diversion and recreation. To learn more about dams and reservoirs visit PBS's Dams Site. What's the Deal with Tidal Power, Anyway?